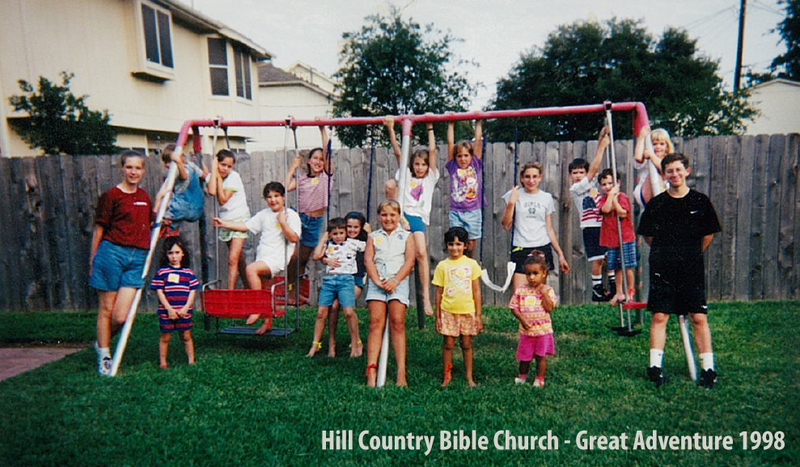 Hill Country Bible Church: Pflugerville, TX > Do You Remember the 90s? As a photographer, I have experienced the progressive change from developing film in a dark room to downloading digital files. While the quality of digital images was debated for few years during the growing pains of change, ultimately we have come to accept the use of modern technology to capture memories which we’d like to preserve…and also some we’d rather not. While the concept of The Great Adventure and Bible Clubs is not new to us, it has continued to grow and change and progress. In the photo below from 1998, my 16-year-old self was oblivious to the depths of God’s power and plan. I was just one kid telling other kids about Jesus and applying the tools I had learned about keeping the attention of restless five-year-olds. I remember learning about voice inflection through the “Boot Camp” training earlier that summer and how to be a great storyteller to make the Bible come alive! It was fun. I was with friends. It was parent-approved. It filled my summer with something productive to do. I didn’t think about how my team’s Driver knew where to take us (before Google Maps existed). I didn’t know about the training that the Bible Club Hosts received ahead of time (or about the love that these adults had for God). I was unaware of the countless hours that it takes to plan and execute Summerfest (I just wanted to nail the dunk tank target!). My teenage mind merely knew that God was at work and I wanted in on whatever He was doing (especially because my friends were doing it, too). So, I fulfilled a role on a Bible Club team to be part of what God was doing. I did not know the impact that those summers would have on my life 20 years later. The growing pains of our current culture include distrust of others which leads to privacy fences and tightly locked garages. It is challenging to build relationships because you must be SO INTENTIONAL. Praying for people takes intentionality, but anyone can. Listening to someone’s joys and sorrows takes intentionality, but anyone can. Eating lunch with someone takes intentionality, but anyone can. Hosting a Bible Club fulfills a role in part of what God is doing. Hosting a Bible Club takes intentionality, but ANYONE CAN! I invite you to take a step of intentionality by hosting a Bible Club this summer. Join God in what He is doing in your neighborhood, in your life, for your good and for His glory.